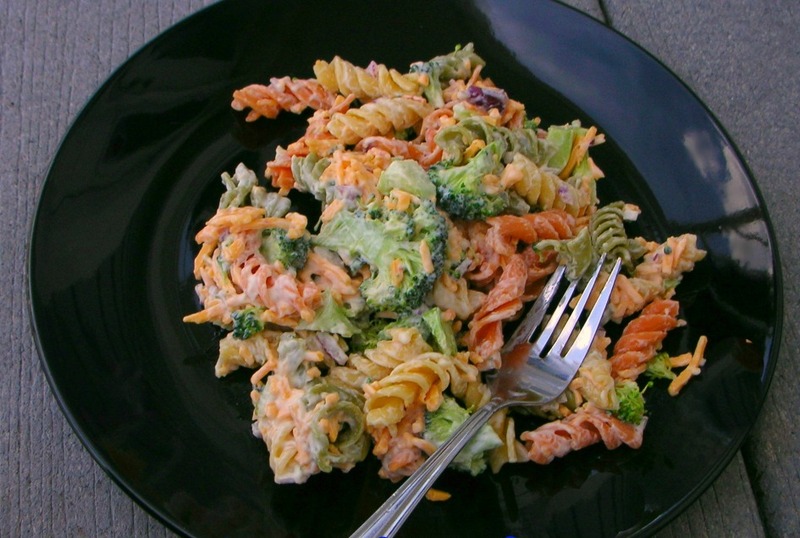 This copycat version of Walmart’s Broccoli Cheddar Pasta Salad tastes just like the original! This broccoli salad will quickly become a family favorite to make time and time again. I’ve mentioned before that I used to work in the deli department of my local Walmart. 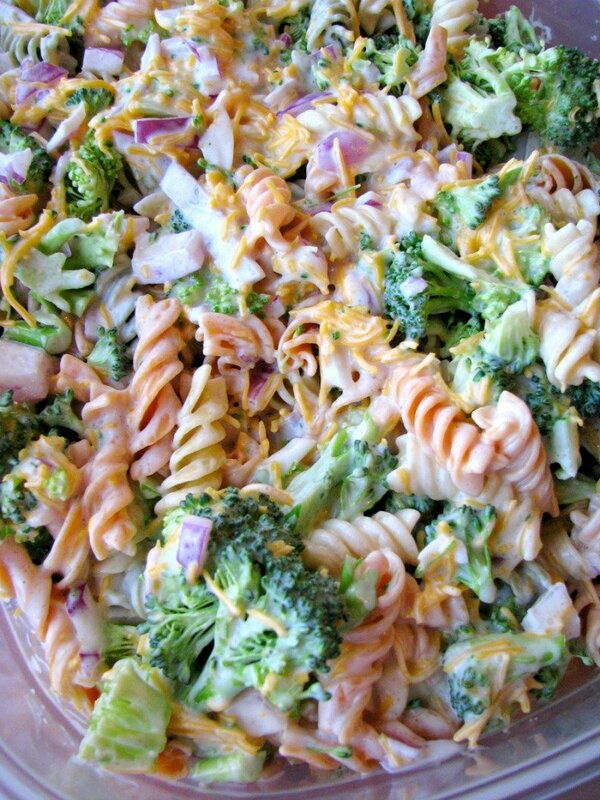 One of my favorite salads at Walmart is Broccoli Cheddar Pasta Salad. It didn’t occur to me to try to make it at home until recently! I’m not sure why, I started making a version of a Mozzarella, Tomato, and Artichoke Salad they used to carry years ago! I guess time passing made me forget about it. I left there 4 years ago when I had my daughter. I finally decided to come up with my own version of the Broccoli Cheddar Pasta Salad to serve at her birthday party last Saturday. What I came up with tastes EXACTLY like the store-bought! 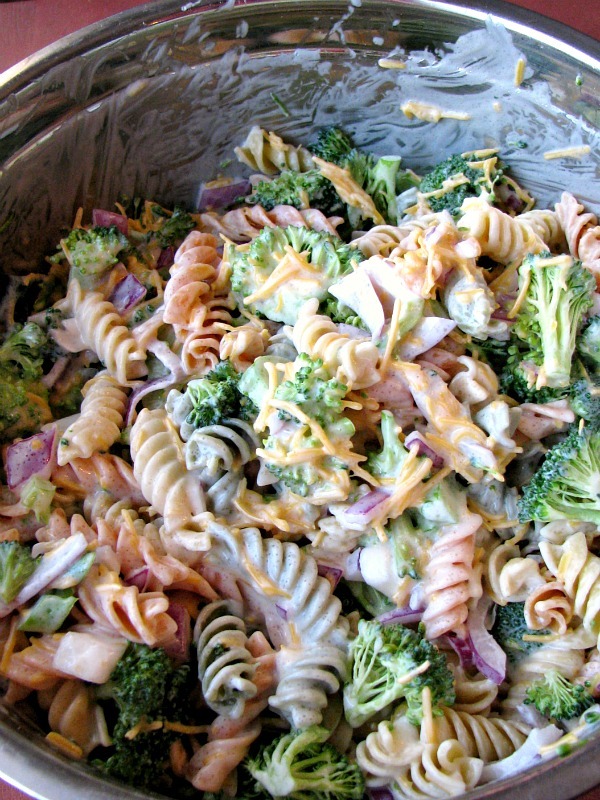 With rotini pasta, fresh broccoli and cheese, diced red onion, and a sweet mayonnaise dressing, this is perfect for summertime cookouts, family get together’s, or anytime. I am updating this post exactly three years and five months to the day that I published it. Since that time, and until just recently, it was my most viewed recipe every single day. It has more than twice the amount of views then any other recipe I’ve ever shared, and yet it never did well on Pinterest because the photo was so small. 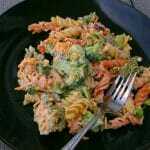 I think it’s simply the fact that it’s a favorite broccoli salad recipe, pasta salad recipe, and copycat recipes out there that makes it so popular. I’ve really learned a lot about photography in the last three years! I still don’t consider myself a photographer, it will always be more that I love to cook and share recipes. I made it several times since, for cookouts and other events, but I could never remember to take better photos, or improve on the writing, until I made it this past Saturday for my “niece’s” 20th birthday party. You can whip up this salad in just a few minutes. It does need to stay cold since it contains mayonnaise, so put it on a bowl of ice or refrigerate it after two hours. 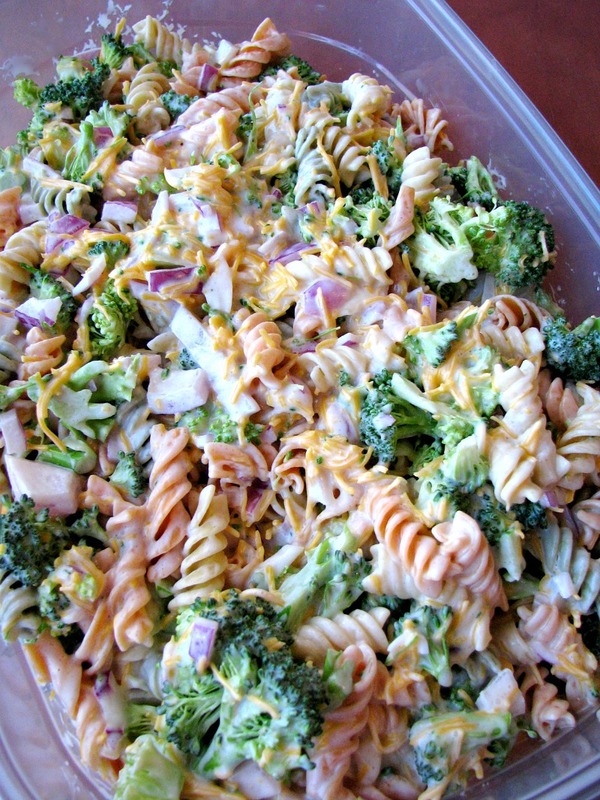 Copycat version of Walmart's Broccoli Cheddar Pasta Salad. Tastes just like the original! Cook pasta according to package directions, with a few drops of olive oil and dashes of salt in the water to keep the pasta from sticking. Drain and rinse under cold water until cool and set aside in a large bowl. Wash the broccoli well and chop into small florets. Chop the onion fine, and mix the broccoli and onions with the pasta. Add the cheddar cheese to the pasta mixture, mix well. In a medium bowl, whisk together the mayonnaise, sugar, and apple cider vinegar well. Pour the mixture over the top of the pasta, broccoli and onions, and stir to combine. Refrigerate until ready to serve. I have made this twice now following your recipe to the letter, and the “dressing” always seems to turn out too thick. It seems to congeal after being in the refrigerator. I have used Hellman’s Real Mayonnaise the first time and then used Hellman’s Olive oil mayo the next time, still not as thin like the Walmart made salad. I’ve bought the salad from Walmart and had it in the refrigerator for a couple of days, and its “dressing” never gets thick or congeals. Any suggestions? This is my go to food for lunch and/or supper when I want to eat light. Hi Robin. I’ve never heard of this happening. I almost always use Hellman’s Real Mayonnaise. Maybe try adding a little bit of water to the dressing, or reduce the mayonnaise slightly. I hope that helps! Thank you very much for that suggestion. Two cups of mayo and 1/2 to 3/4 cup of water did the trick. Now it’s not thick. I just have to remember to stir it before seving. Great, I’m glad that worked out for you! Thank you for this! I absolutely love the broccoli cheddar pasta at walmart and this came out exactly like it! So happy I can save some money by making it myself whenever I feel like now. 🙂 Thanks for sharing/figuring out a copycat recipe! One must rate this recipe five stars because it 100% fulfills it obligation as an exact copycat! I am tempted to make this next time with “plain” rotini so the consumers don’t “think” I purchased this salad and then simply placed it in my own bowl in attempt to pass it off as my own…for real…it’s that spot on! Lololol. I have sent this webpage to numerous people requesting the recipe. Thank you for creating such a perfect copycat. Hi Yaavie, I’m so glad you liked it and thanks for sending the link to your friends! I made this 2 days ago for dinner and lunch the next. The apple cider vinegar didnt agree with my stomach at all. Is there a different ingredient I could use instead of apple cider vinegar? Hi Chelsea, I’m really not sure what to say. You could use plain white vinegar, but I would think that would bother your stomach as well. You could try to thin out the mayonnaise with water, but the dressing won’t have the same flavor. If you find a good substitution, I would love to hear what it is! I saw the nutritional information but what is the serving size? 4oz, 8oz or what?? This was delicious and I’m watching what I eat. I’m hoping 1/2 cup isn’t going to be my carb limit for the day. 😂. Thank you! Hi Michelle, I would say a cup equals a serving based off the original recipe serving 8 people. Thank you! It was delicious and worth it! Could I use miracle whip in place of the mayo? Hi Whitney, you can but I haven’t tried it. It will definitely be more tangy.